A luthier (/ˈluːtiər/ LOO-ti-ər) is someone who builds or repairs string instruments generally consisting of a neck and a sound box. The word "luthier" comes from the French word luth, which means lute. The term originally referred to makers of lutes and is now used interchangeably with any term that refers to makers of a specific, or specialty, type of stringed instrument, such as violin maker, guitar maker, or lute maker, but excluding makers of instruments such as harps and pianos, which require different skills and construction methods because their strings are secured to a frame. Bowed instruments include: cello, crwth, double bass, erhu, fiddle, hudok, mouthbow, nyckelharpa, hurdy-gurdy, rabab, rebec, sarangi, viol (viola da gamba), viola, viola da braccio, viola d'amore, and violin. The purported "inventor" of the violin is Andrea Amati. Amati was originally a lute maker, but turned to the new instrument form of violin in the mid-16th century. He was the progenitor of the famous Amati family of luthiers active in Cremona, Italy until the 18th century. Andrea Amati had two sons. His eldest was Antonio Amati (circa 1537–1607), and the younger, Girolamo Amati (circa 1561–1630). Girolamo is better known as Hieronymus, and together with his brother, produced many violins with labels inside the instrument reading "A&H". Antonio died having no known offspring, but Hieronymus became a father. His son Nicolò (1596–1684) was himself an important master luthier who had several apprentices of note, including Antonio Stradivari (probably), Andrea Guarneri, Bartolomeo Cristofori, Bartolomeo Pasta, Jacob Railich, Giovanni Battista Rogeri, Matthias Klotz, and possibly Jacob Stainer. Gasparo da Salò of Brescia (Italy) was another important early luthier of the violin family. About 80 of his instruments survive, and around 100 documents that relate to his work. He was also a double bass player—and son and nephew of two violin players: Francesco and Agosti. 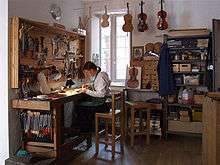 Luthiers born in the mid-17th century include Giovanni Grancino, Carlo Giuseppe Testore, and his sons Carlo Antonio Testore and Paolo Antonio Testore, all from Milan. From Venice the luthiers Matteo Goffriller, Domenico Montagnana, Sanctus Seraphin, and Carlo Annibale Tononi were principals in the Venetian school of violin making (although the latter began his career in Bologna). The Bergonzi family of luthiers were the successors to the Amati family in Cremona. David Tecchler, who was born in Austria, later worked in both Venice and Rome. The early 19th-century luthiers of the Mirecourt school of violin making in France were the Vuillaume family, Charles Jean Baptiste Collin-Mezin, and Collin-Mezin's son, Charles Collin-Mezin, Jr.. Nicola Utili (also known as Nicola da Castel Bolognese) (Ravenna,Italy, March 1888 – May 1962), beside traditional lute works, experimented the making of "pear-shaped" violins. ↑ "Arts, Music, Instruments, Stringed". DMOZ. Retrieved 2006-11-03. ↑ Gruhn, George. "Rickenbacker Electro Spanish Guitar". Retrieved 2006-11-04. ↑ Hill, W. Henry Hill, Arthur F. Hill and Alfred E. (1963). Antonio Stradivari: His Life and Work, 1664–1737 (New Dover ed.). New York: Dover. p. 27. ISBN 0-486-20425-1. ↑ Pio, Stefano (2004). Violin and Lute Makers of Venice 1640–1760. venezia, Italy: Venice research. p. 383. ISBN 978-88-907252-2-7. ↑ Bartruff, William. "The History of the Violin". Retrieved 2006-11-03.